Check out award winning actor Nicolas Cage in these two action/adventure films. PAY THE GHOST - Mike Lawford (Nicolas Cage) will stop at nothing to unravel the mystery and find his son. 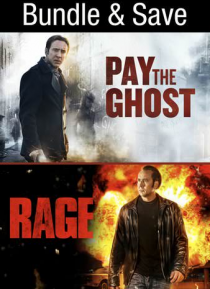 RAGE- Paul Maguire's (Nicolas Cage) daughter is kidnapped, he falls back on old habits that lead him down a dark and bloody path of revenge, betrayal and long buried secrets.